Sanai, Saunf, Mulethi, Jangharar, Sonth, Sajji Khar. Very useful remedy in treating chronic and habitual constipation. 1-2 teaspoonful with milk at bed time. 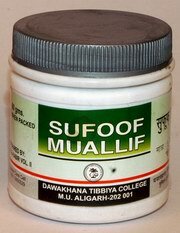 Useful in eye disorders, constipation and other gastric disorders. 1 tsf twice a day with water.